It has been some time since I saw a movie that was able to provoke such an adrenaline rush in my body that I felt the need to engage in a battle with imaginary villains. 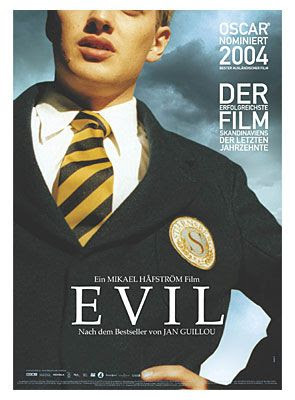 After watching the Swedish film Evil (2003), I even felt like a braindead football fan whose home team had just won the Super Bowl. The film stars Andreas Wilson, who also happens to moonlight as a model for Abercrombie & Fitch, a preppy clothing company that the pseudo-suave aristocratic antagonists (the Sixth Formers) featured in Evil would be indubitably fond of. Of course, those individuals that find themselves adoring the latest line of Abercrombie & Fitch clothing might also find themselves feeling vulgarized by the anti-upper-class sentiments of Evil. 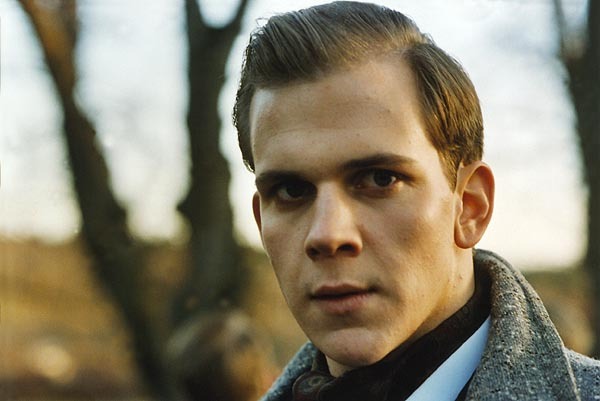 The film is based on the semi-autobiographical novel Ondskan by Swedish author Jan Guillou. Falling in line with Guillou's political views (he was a member of various Communist organizations during his life), Evil examines institutional violence and class exploitation inside the vacuum of a private boarding school. 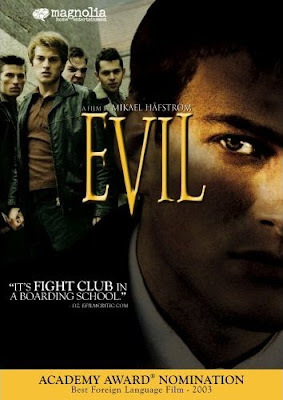 The protagonist of Evil, Erik Ponti, is forced to enroll in a private boarding school after he is expelled from his previous school for brutally beating another student. After expelling Erik for his barbaric actions, the headmaster calls him "Evil", hence the title of the film. Upon enrolling at his new school Stjärnsberg, Erik is determined to refrain from violence, but soon realizes that violence is a longstanding tradition at his new school of residence. Apparently, due to the popularity of the best-selling novel Ondskan, plans for a cinematic adaptation of the book had been in the woodworks (including various failed attempts) long before the 2003 feature-length film Evil was ever conceived. Director Mikael Håfström was originally expected to create Evil as a television series, but held the production in limbo for such a long time that he eventually able to convince the producers to allow him direct it as a feature-length film. The best way I can describe Evil to an uninitiated viewer is by stating that it is the polar opposite of Evelyn Waugh's Brideshead Revisited. 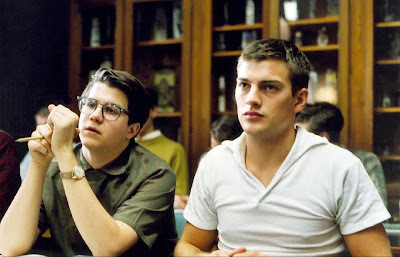 Instead of acting like a gentleman by attempting to fit in with members of the aristocratic class (like the protagonist of Brideshead Revisited), Erik almost immediately decides to engage in a battle of class war against the Sixth Formers (the older aristocratic classmates). Due to the unnecessary beatings he has taken from his sadistic stepfather, Erik can unflinchingly endure the worst forms of punishment from the Sixth Formers. Erik forms a strong friendship with his physically weak yet intellectually superior roommate Pierre, making for a truly humorous odd couple. When the Sixth Formers realize that they cannot break Erik's glaring stoicism, they go for the easy target of Pierre, a softy that finds all forms of punishment intolerable. Erik also begins a sexual relationship with a beautiful Finnish proletarian worker girl (an expellable offense at his institution) who also becomes a target of the Sixth Formers. Inspired by Gandhi's resistance to tyranny's through nonviolent civil-disobedience, Erik strategically battles the Sixth Formers through a variety of unconventional methods. Of course, Erik soon realizes that his pacifist stance is somewhat futile and eventually engages in the sort of violence that he originally hoped to abstain from. I must admit that it has been some time since I saw a film like Evil, where I found myself deeply empathizing with the protagonist. I can especially sympathize with Erik's one-man crusade against an unjust (and ultimately irrelevant) system. I have always been bothered by the all too common situation where - although a person finds a particular institution or school to be at odds with their own worldview - they rarely act accordingly and wage war against it. Not only does Erik battle his enemies; he immediately gets back up again after being beaten and fights even harder than before. Despite finding myself at odds with the political message of Evil, the film left me flabbergasted, in such a content state that I could not find anything lacking in the film. Evil may not be an innovating work of cinematic art, yet the film conjures up a rollercoaster of emotions, from the beginning to end - inspiring me to write this review in gratitude to the marvelous writer, director, and performers, who have created what I consider to be: my latest, greatest personal cinematic fling. Evil might contain a nihilistic message of destroying institutional violence by engaging in violence, yet the dubious moral seems even more pertinent as I re-watch the film and once again experience how the plot thickens. In Evil, Erik is perturbed by a teacher (who ironically uses Erik to illustrate to his class what a fine Aryan specimen looks like) who is the last remnant of the fascist curriculum that used to embody the institution. With the help of a "progressive" swim coach (who is rumored to be a social democrat), Erik is inspired to win a big swim match, thus humiliating a group of Sixth Formers. Throughout the film, various students and professors have committed themselves to social democracy, illuminating that times are changing and a new political era in Sweden is about to begin. With the recent international popularity of communist Stieg Larsson's Lisbeth Salander novels/film adaptation, it is apparent that the revolutionary actions of people like Erik in Evil have radically changed the political climate of Sweden from within. The modern radical equivalent of Erik would probably be a Swedish nationalist - whose motivation would be to battle against the new institutional tyranny ("political correctness") and revamp the political persuasion of Sweden, once again installing traditional values that earlier subversives fought so eagerly to end. Either way, Evil is a superb cinematic testament as to how Sweden - the land of Vikings - became the land of marxists, feminists and male breastfeeding. Stupendously smart review, dear boy. EVIL is one of my favorite films of all time. I recently screened EVIL and INNOCENCE to some acquaintances as some kind of bizarre double feature. It stunned them. As usual, your take on the subject kicks the stuffing out of the rest. I am glad to know that other serious film fanatics also hold EVIL in high regard. I will look into hunting down a copy of INNOCENCE. Okay now this sounds right up my alley!! I'm so watching this one. Luckily I can load it instantly on Netflix! YAY! So it looks like I will actually get to watch this soon. I don't remember if I told you guys but I recently watched "Rubber" and I'm sorry but that was awesome. I mean it's definitely not going to be everyones cup of tea and not everyone is going to get it but I really enjoyed what it had to offer. Also, I gave you guys an award on my site. The award asks you to do these silly things but I don't expect you to do them. I just thought you guys deserved this award (the Versatile Blogger award). You won't regret watching EVIL! I can't comment on Rubber, I haven't seen it. Nicole- I am glad that you watched EVIL and enjoyed it! Indeed, Silverhielm is a shithead.